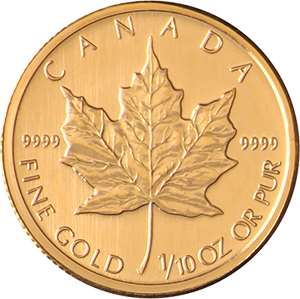 The 1/10 oz Maple Leaf is a gold bullion coin issued by the government of Canada. Much like the American Eagle, the Maple Leaf is .9999% pure, or 24 carats. Among the major mints in the world, this makes the Maple Leaf of the very highest quality and is coveted by collectors and investors alike. Despite it’s purity, it typically trades above the value of its gold content, as is usually the case for government minted coins of high renowned. First introduced in 1979, it remains one of the most sough after coins in global gold investments. The design of the 1/10 oz Maple Leaf shows Queen Elizabeth II on the obverse and the iconic Canadian Maple Leaf on the inverse. The coin is known for its simplistic beauty and light touch. It has a face value of $5, making it the fourth largest (or third smallest) denomination of all the standard Maple Leaf coins. The coin itself trades at a much higher value of course. 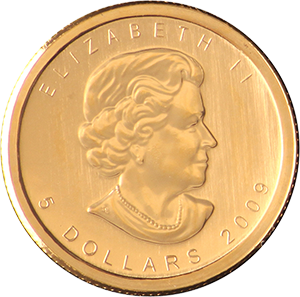 As with any fine gold coin of such purity, it is essential to store and care for the 1/10 oz Maple Leaf carefully. This is due to the fact that the purer the gold, the easier it is to mark it. Fine gold is notoriously soft and careless handling can lead to the coin becoming damaged and its value tarnished. For this reason it is important to ensure that any vendor trading in fine gold should be of high renowned and that any products they sell are well described and valued accordingly. Goldinvestments.co.uk are one of the UK’s oldest vendors of precious metals and collectables. With decades experience in the field, we also provide expert advice from our London based office about investment, storage and anything else related to precious metal investment.